Special thanks to Michael Clark for writing this special guest post about the case for campus makerspaces. If you would like to share your thoughts about making, get in touch (info@dhmakerbus.com) – we’d love to feature your work. For the past three years, I’ve been attending St. Laurence College (Kingston), in the Energy Systems Engineering program. As I write this, I’ve completed all classwork and working at my co-op placement. As I reflect back on my time here, I am able to draw the conclusion that St. Laurence College would benefit greatly from a Makerspace. I started college with little to no practical tool experience. My situation was not unique, as many students who come straight from high school are also inexperienced using hand and bench tools. When projects requiring fabrication came up, I made do using simple hand tools, but was very hesitant to start using the drill press, band saw, or other bench tools. The equipment was available within the school, but I neither knew how to use it, nor had the confidence to begin learning how. Fabrication of that sort was not within the scope of classroom work in our program, so there was no opportunity to learn it within a teacher-student environment. Enter the need for a makerspace. That same hesitancy, lack of confidence and feeling of “I don’t know what I’m doing” when standing over a workbench, are exactly the sorts of emotions which are conquered through the coaching atmosphere of a makerspace. In a makerspace, the novice would first attend tool training workshops before attempting their own projects. They would be instructed in the proper use of a tool before using it. They would gain an understanding of which tool was right for which task. From this knowledge, confidence is built. From confidence, comes ambition. In my three years here, for classroom, applied research and personal projects, I’ve worked with wood, steel, aluminum, Plexiglas, plastic and more. I’ve used the drill press, band saw, circular saw, hydraulic hole punch, hand drill, jig saw, bench and angle grinders, as well as a whole host of smaller hand tools. Only now, after three years, can I claim to have developed a solid foundational base in the practical use of hand and bench tools. I wish there had been a makerspace on campus where I could have learned the skills and techniques of fabrication early on. I wish there had been available on campus “crash-courses” in woodworking, metalworking, welding, basic and advanced tool use. If I had had available to me this learning opportunity, I would have certainly taken advantage of it, as I imagine many other students would. Working with your hands in a fabrication shop is an entirely different human experience to sitting at a computer or in a classroom. While the latter is nearly all above the shoulders mind work, the former has the body and brain working in unison. Part of becoming an efficient fabricator is teaching your body how to move. Through practice, your hands learn where they have to be on the drill press, your legs learn where they have to stand when you’re operating the table saw, and so on. The productivity that comes with experience is in no small part due to muscle memory, earned through putting the hours in at the shop. And the earlier in life you start, the better. A Makerspace would be THE place to learn these vital skills. If you’re a fresh-in from high school, it’s a place where you could learn basic safety and tool skills. If you’re already an experienced fabricator, it’s a place for you to work on your project. If you’re studying computer science but want to augment your expertise, why not take a makerspace workshop on welding. If you’re studying masonry but are inexperienced with woodworking, sign up for a makerspace woodworking workshop to fill out your resume. A makerspace is ideally situated to give students the opportunity to learn practical skills that otherwise they would not learn during their normal coursework. I’m of the opinion that graduates of my program, who began inexperienced with practical tool skills, and have not sought extra-curricular opportunities to learn, are at a competitive disadvantage to those that did. I assert that a campus with a makerspace produces students that are more employable than a campus without. Attached with this blog post is a poster that was shown last month (March 30th) at the Green Profit Symposium at the Four-Points Sheraton, Kingston. 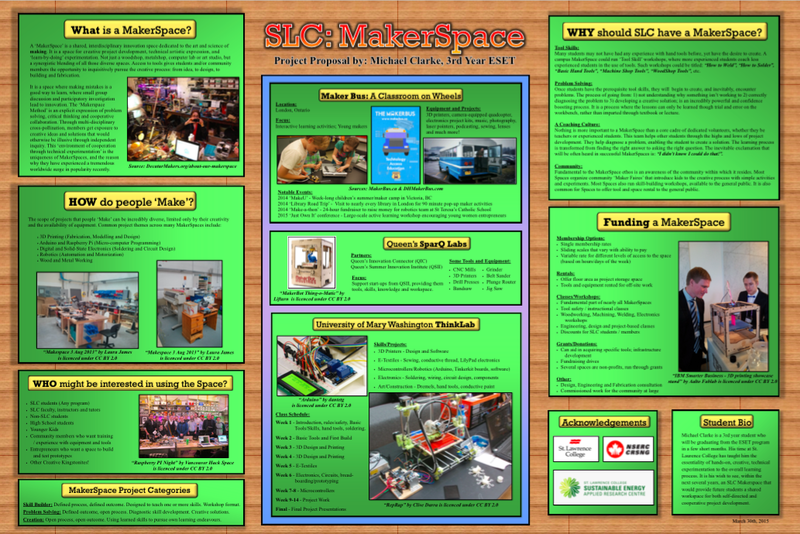 The poster is a ‘project proposal’ of sorts, and seeks to explain why a makerspace would be beneficial to St. Laurence College. While the Green Profit conference was specifically related to renewable energy, the poster generated some interest amongst attendees across a spectrum of professions. After all, learning is everyone’s profession, and the hands-on learning that takes place within the coaching environment of a makerspace is invaluable. My gratitude to the Makerbus team, Beth, Kimberley, James and Ryan, for the work they do with Makerbus. My specific thanks to Ryan, who granted me permission to use several Makerbus photos in the poster, and who offered to host this post on their blog. If anyone wishes to contact me for further discussion, please don’t hesitate to send me an email at the address below. Disclaimer: This blog post reflects only the opinion of the author, and may not represent the opinions of St. Laurence College, its staff, instructors or other students.